In our last post, we started a series on studying how people used to cut rifling in their barrels manually, without the benefit of modern machinery. In our last post, we left off with the study of an important woodworking and metalworking tool, the lathe. As we saw in our last post, lathes were available to various cultures around the world, since the times of ancient Egypt, so it is pretty reasonable to assume that they were available to people around 1500 AD as well. In today's post, we will look into the construction of an indexing guide. This is basically the part of the rifling machine that twists the cutting tool at a fixed rate, so that it cuts the required rifling grooves inside the barrel. This is the one part of an ancient rifling machine that needs to be as accurate as possible. Of course, we will first study how they built the most complicated part, so that the rest will appear a lot easier! The next thing to do is inscribe a groove on the thickest part of the cylinder (i.e. the part that is 50 inches long). The groove will help guide the cutting tool at the required twist rate. Here, AB is 48 inches long (because we wanted a twist rate of 1 turn in 48 inches) and the length of side BC is equal to the circumference of the wooden log that was just shaped. The gunsmith can calculate the length of BC to be (pi * diameter of the cylinder), or the gunsmith can simply measure this out by wrapping a thin thread around the surface of the cylinder and marking it, then placing the thread on the line BC and measuring out the length of the markings. The only trick is ensuring that the angle ABC is a right angle (i.e. 90 degrees) and as we will see, measuring this out is a piece of cake as well. This might be a good time to talk about how people measured right angles back in the day, if only for the reason that such knowledge of geometry is gradually being lost today unfortunately. Today, any student can buy a protractor at any stationary shop for a couple of dollars (A 10 piece Staedtler mathematical instrument set cost me $3.99 and it contains a protractor, two set squares, a compass, pencil sharpener, pencil, a ruler etc.). However, a protractor wasn't in common use before the 19th century and such instruments were generally more expensive before the 19th century and weren't easily affordable to ordinary smiths. So let us only consider instruments that were cheap and widely available for that era. As it turns out, ancient civilizations like the Egyptians and the Chinese had already developed set squares, way back in the day (Egyptians seem to have had them as far back as 1300 BC or so), so they were probably widely available to various people in the middle ages as well. While you can't measure any angle with a set square like you can with a protractor, they can be used to measure right angles very well. 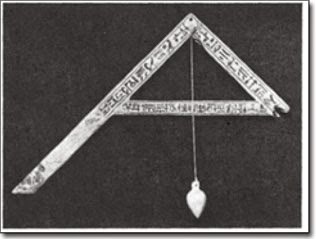 Ancient Egyptian set square from 1300 BC. The above instrument is from ancient Egypt and such instruments were known back in the time of the Pharoah Ramses and used by them to build pyramids, so they were definitely widely available in many countries by the middle ages. Using one of these instruments, a gunsmith could have easily drawn a right angle. The other ancient mathematical instrument is the compass, which was also known to ancient civilizations like the Greeks, Chinese, Indians, Romans etc. For example, Euclid's classic mathematical work Elements from around 300 BC mentions compass and straight-edge problems in book II of the series, and a classic Chinese mathematical text, the Zhoubi Suanjing from around 100 BC, also mentions the use of set square and compass in geometry problems. Ancient compass instruments have been found intact in the ruins of Roman cities like Pompeii and ancient Indian mathematical texts also talk about usage of such instruments. Voila, angle ABE is a right angle and it has been drawn without any sophisticated (for that time) instruments at all. The indexing guide was actually one of the trickiest parts that the gunsmith needed to manufacture for his manual rifling machine. As you can see, even in the middle ages without access to any sophisticated modern tools, it was possible for a skilled workman to construct an indexing guide pretty accurately. In the next post, we will look at the next part that needs to be constructed relatively accurately, the indexing head and pin. Then we will look at how the remaining parts were built and how the machine was assembled in subsequent posts. Actually a lot of cool info here. I had seen the trick for finding a 90 with the compass a long time ago and had completely forgotten it. Now I am seriously looking forward to seeing how this 4 inch thick indexing guide transfers the helical line to the inside of a rifle barrel. You can also make (or check) for square using 3-4-5 triangles, where the sides are 3x, 4x, and 5x long. this requires fairly accurate measurements, but works well.